What a beautiful boy….thanks for the education about the train. Had no idea. Thanks Simone. Hopefully in the near future some more actions will be taken to address this problem. Thotful post. 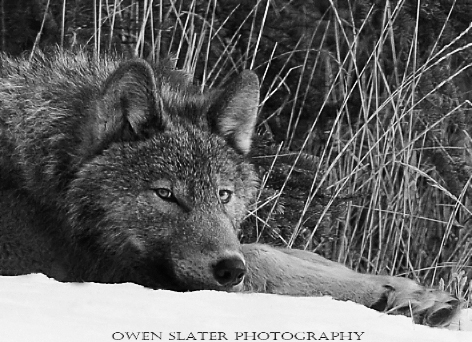 I find it so discouraging to read about yet another wolf or bear killed in the park by trains or traffic. You make an excellent point about visitors not feeding the animals and yet CP does it regularly. It was good you provided the phone number. I’m not there that often (sadly) but I’ll have when we visit in June. Very discouraging indeed. Glad I could help with the phone number and maybe I will see you out there in June. That would be great since you seem to be where the wildlife hangs out. Great information. How sad. One can still hope? I don’t know anymore. My heart breaks. But thanks for a wonderful post – I didn’t realize the trains (in particular) were so very deadly. These predators…and all wildlife, really…have far too much to contend with in our world today. It would be nice if your beautiful photo and this news could get out…. It is my understanding that wolves and other wildlife also use the area around the tracks as a travel route, as it offers a “path of least resistance”, so to speak. 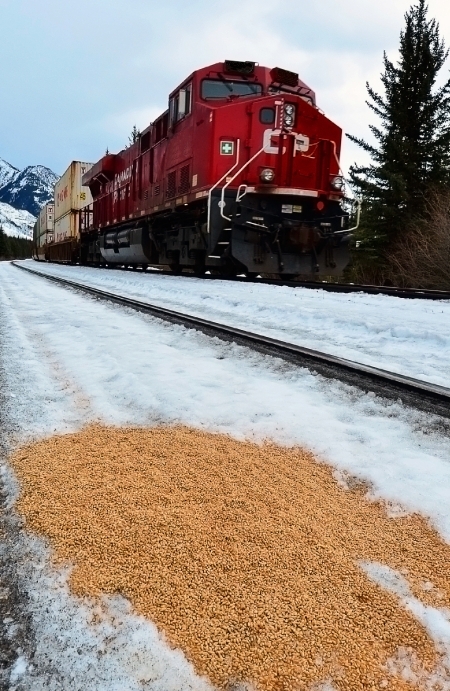 So with this, in addition to spilled grain, the train tracks will remain a threat to wildlife. A local wolf researcher has suggested speed limits for trains, but these would obviously have to be enforced. And speed limits are not enforced on either the TCH or the 1A, where wolves and other predators are regularly killed by motor vehicles. It is beyond frustrating that Parks Canada and organizations like CP Rail will not commit to action, by beginning to experiment with some simple solutions (i.e., speed limits and enforcement of..), versus allowing joint conservation efforts to inevitably become a bureaucratic slog that will likely continue for many more years, if the recent past is any indication. What a beautifully charismatic photo of an iconic creature that was robbed of the opportunity to live its full, natural life. Thanks for your comments. The wolves and other wildlife will use the tracks and any other linear transects to travel quickly through the park so ya, the deaths on the tracks won’t completely stop when the grain leaks are fixed but the number of deaths should decrease substantially. While historically there hasn’t been much speed enforcement on the 1A or TCH, in the past year I have seen improvements recently with even unmarked police cars being used. CP and Parks Canada are currently testing the used of electric mats to see if these can be used to keep the animals off the tracks, especially in certain hot spot areas and CP has given more money to Parks. Hopefully this leads to a more coordinated effort and more results. Time will tell I guess.